Facebook is an effective platform for promoting your brand and communicating with both current and prospective clients. One question we are frequently asked though is “How exactly should I do this?”. As a financial advisor, it can be tough to stay up to date on all the features (and how to use them!) since the platform is constantly changing. 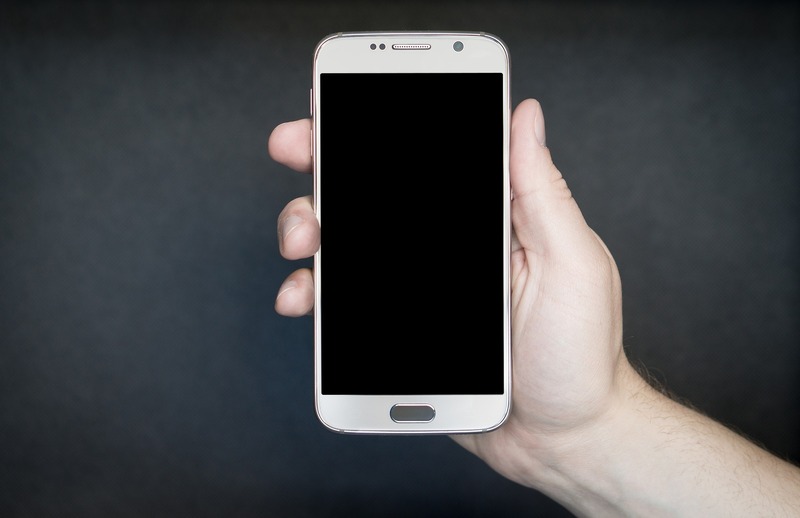 But since so many of the clients and prospects you hop to connect with are on Facebook, it would be a mistake to overlook this social media channel. To gain a better understanding of your Facebook company page’s features, first check out A Breakdown of Facebook’s New Business Page Features. Once you have a solid understanding of Facebook’s capabilities, it’s time to begin strategizing. A key component of succeeding on social media is to remember that it should be a two-way conversation. If you’re only promoting your firm and posting about yourself, people will quickly become uninterested. In order for users to best engage with your page, you need to engage with them as well. The following list outlines 6 ways to use your company page to interact with users. If you want people to like your page, a good starting point is to like their page. They will receive a notification and be more inclined to then click on and visit your page, often then reciprocating the gesture and liking your page back. To like another Facebook page as your page, go to the page you want to like, click on the three dots on the page’s cover photo, and click on the Like as Your Page link. You’ll then get a drop-down menu showing all of the pages you manage. This list will include your pages within Business Manager. Once you select the page you want to use, click the Save button. You’ll then receive a confirmation that the page has been added to your favorites. If you want to post directly to the wall of a Facebook page as your page, use the drop-down at the top right of the status update box to select the page you want to comment as. You can now hover over your profile photo at the top right of the status box to confirm that you intend to post as your page. Once you’ve completed your post, it should appear in the Visitor Posts box on the left sidebar of the page. There’s a similar approach when you want to like or comment on a page’s posts. 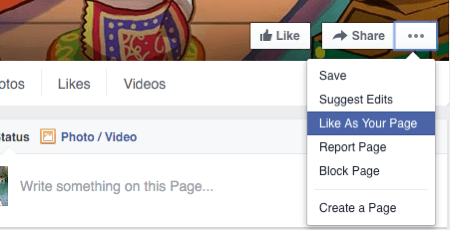 Simply use the drop-down next to your profile photo and change it to the page you want to like or comment with. 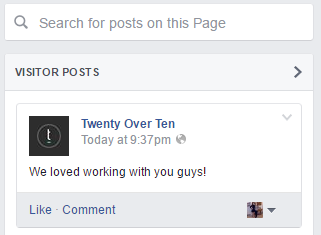 This allows you to like and comment on the post as your page. It will also allow you to share the post on your Facebook page. 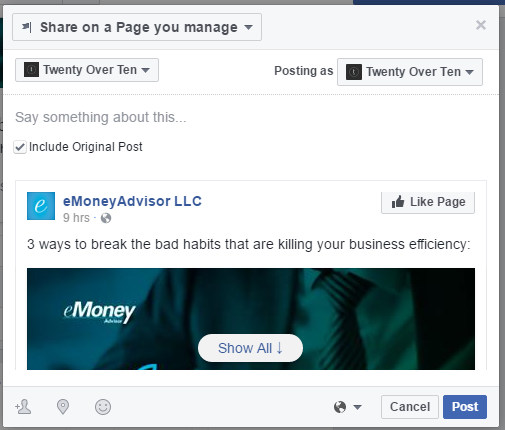 In some cases, when you share a post that has a status and a link, you may have the option to share the original post. The original would include a link to the author of the post and the group itself, along with the author’s commentary and a link to the article being discussed. Uncheck the Include Original Post box if you want to merely share the article link. 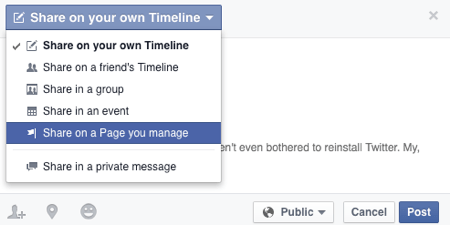 Regardless, you can always add your own status above the share and then post to your selected page when ready. 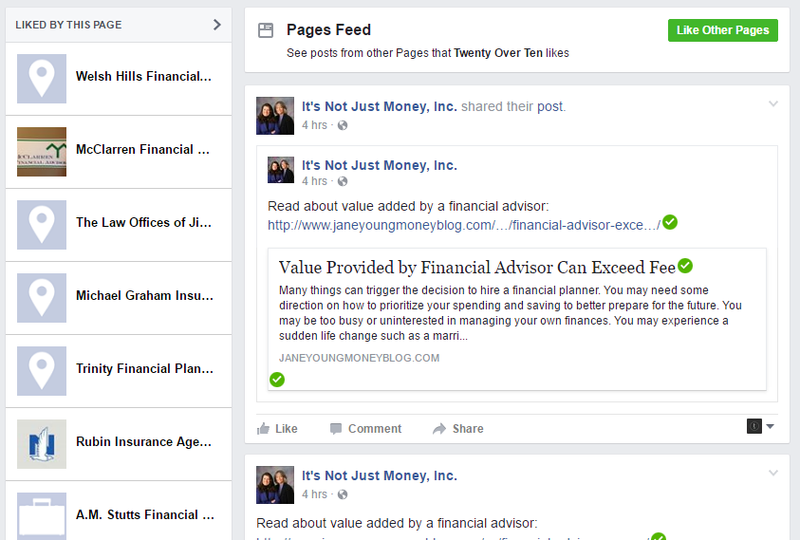 To view all of the most recent updates from Facebook pages you’ve liked as your page, go to your page and click on See Pages Feed. Here, you can see the pages that your page has liked in the left sidebar with the latest updates from those pages in the right column news feed. 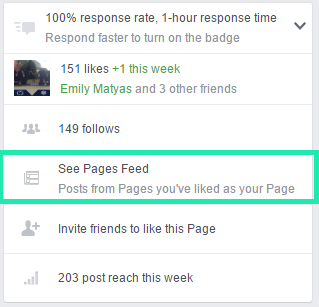 From your pages feed, you can engage with updates automatically from your page. When someone mentions your page in a post, you will be notified. You are able to view these notifications under your page’s Notifications tab in the Activity section. While it’s often helpful to your brand just to be mentioned by someone in their post, engaging in that post leaves the user feeling special, important, and heard. Make sure that your page notifications are turned on if you’d like to be regularly notified of new page activity and promptly engage with people who mention you. Facebook Live: The Future of Advisor Marketing?